Can someone explain why we are seeing the Iraqi Dinar still "for sale" even in this page? 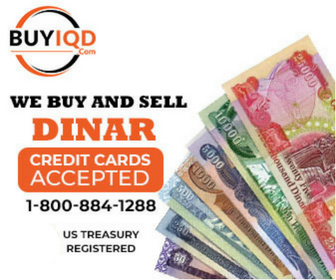 If and when the Dinar RV, these dealers should be out of the Dinar or sold out. They are the ones making money in my opinion. This could be the biggest and longest hoax ever was. Hi, I don't know where to post this question: Where can I get information regarding offshore banking or offshore corporations. thanks! Great Post Phenix, I'm just barely getting started educationing me on the Iraq/Dinar deal. I don't even know what lop means, but I get the general picture. I have a very small investment and would buy more Iraq Dinar if I had money, so I'm just thanking you for your analysis and I'll keep my fingers crossed for the VR. GIAssociates is the company I used to buy my ID on September 3. Sent a Cashiers Check and I found out yesterday that they run out of ID and they have a 3 day back log. So I will receive mine until Sept 16 or Sept. 17. Nothing I can do about. If I buy more ID, it will be through somebody else. WHAT ARE THE Steps for VIP and Dinar-ified? Thanks, where can I find the mods. list. I was given a generic password, Now I need to create a new password, Please advice how and where to go to change or create a new password, Thanks!!! Hello, I just joined this fantastic website and the Forum can be overwhelming...lots and lots of information. So I have looked everywhere how to become a VIP and would like to know step by step. I will be getting my Dinars any day. Bought them last week. I would like to know the steps to become a VIP and Dinar-ified. THANKS!!! Thanks so much for all those who answered my question, this is amazing how you guys responded quickly. Just by pure coincidence I purchased mine from GIDAssociates. I opted for sending a Cashier's Check and I'm waiting for the delivery next week. I'm so glad I made the right choice. I will try to send the picture next week to get into the Dinar Club here, I just can't remember the name. I wish I had more funds, but I put up to the last penny. I 'll keep adding more whenever I can until things, happen. This website is awsome, I'm getting an education. Thanks again! !